“Ten years ago I was sitting exactly where you are,” said Brandon Robbins, in front of the loyal and enthusiastic crowd at the Velour Live Art Gallery. “Ten years ago I came to visit my brother here in Provo and I was so impressed with this place that I went back to Washington, packed up, and moved here to start a band.” The band he was speaking of was The Moth & the Flame, a dark brooding collaboration of rock soul that finds its way into your chest and haunts it like a song you can’t get out of your head. Robbins goes on to express his love of the Velour Live Art Gallery and hopes he can do the venue justice the way it inspired him all those years ago. Those years have proven to be more than a little productive as The Moth & the Flame have now garnered international status and have been featured twice now at the SXSW festival. Even though they now live in Los Angeles, they still take time to visit the city they love and honor the place that started it all. “The Velour Live Art Gallery has the best visual aesthetic of any venue in Utah,” claims Stacey Mills, a local waitress in Provo; to which I happen to agree with. The ceiling dripped with garnishments and projectors with various backdrops. The stage for this special acoustic show was shifted to ground level at the center of the venue, adding the intimacy that raised platforms of traditional stages can’t compete with. There’s something about being eye level with a performer you’re singing along with that adds a level of connection to the experience. Performers feel more human when you’re not always having to look up to them; and all the performers this evening felt very alive and real. Provo band Sun House came out first and did a splendid job of setting the tone for the evening. His strong vocals and catchy rhythms paid tribute to all things Utah as he sang of majestic mountains and our frontier-like origins. He sang a cover of an old settler song called “Bury Me Not On The Lone Prairie” that had the couple in front of me in tears. The passion for his music won the crowd over and the end of every song was met with loud applause. Sun House thanked the crowd for showing up “on time” to hear his set and wished everyone well before leaving the stage. The Moth & the Flame come out, like they do at all their shows, and get right to playing music. They do not present themselves as rock stars taking in the fame presented by cheering crowds. They get to business and display that incredible work ethic that has sustained them through vigorous years of touring. The Moth & the Flame are artists in the complete sense of the word and not just limited to being musicians. In their early days to promote shows, they would create artistic displays throughout Provo, some of which reached 20 ft. into the air. Their initial album, released on 11-11-11, is only available in hard copy because they wanted to promote the album’s art work. Sadly, the wave of digital music has left that medium in neglect, which dampens the overall effect and feeling of most modern music. The Moth & the Flame make no secretes about their artistic intentions. They want to inspire people the way they were inspired. They want to create that fire and passion we all felt at one time sitting in our childhood bedrooms with head phones on, reciting lyrics we felt were written just for us. They want to give back to art what it gave to them. If only every band felt this way about the music they make. Art is always about the flame it creates in the individual, not the flame it holds for itself. 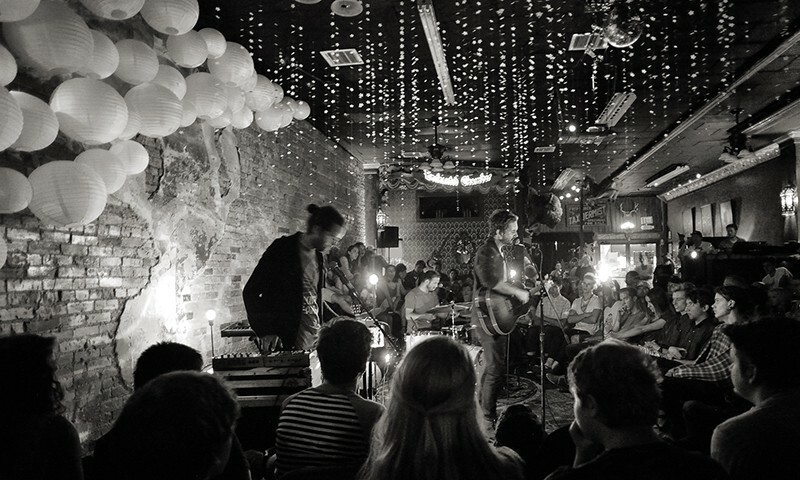 The Moth & the Flame played a set of almost entirely new songs. Only “Sorry” stood out as a track from their prior EP &, and the crowd acknowledged it’s presence with polite acoustic cheers. “Wishing Well” was a fantastic new song that is certain to become a staple in The Moth & the Flame catalogue. As I spoke with those around me, everyone seemed very excited by the new tracks and Robbins took the time to explain the heart behind most of them. The song “Wishing Well,” in particular, was about his mom and her incredibly giving spirit. After the set the band came alive in another way. In a very unusual move they walked off the stage directly into the crowd and were instantly absorbed by hugs and friends. It was a wonderful experience to see band members relate to their audience on a first name basis. I heard more conversations about “old times” than the usual fan fare of “love your music.” The atmosphere felt like family and The Moth & the Flame took time with everyone. Once again Utah’s music scene stands beyond impression and nestled into the incredible heart that fuels its music. Everyone I met was very honored to be a part of the evening and as always I am honored to write about it. 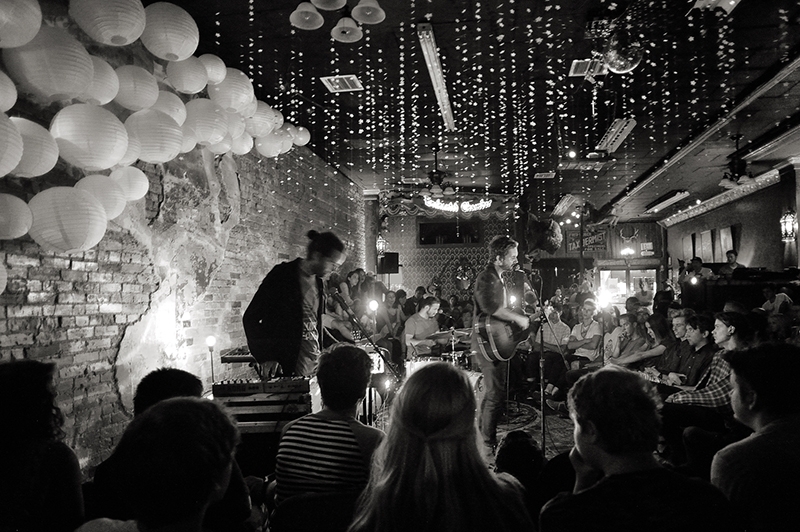 Thanks again to Sun House and The Moth and & the Flame for inspiring us the way they were ten years ago, at a little ol’ art gallery in Provo.